What does INGOT mean in relation to Native American jewelry? Early Native American jewelry (pre-1930’s) was usually hand forged from hand-made, hand-poured ingots. An ingot is a simply a bar or block of metal. The blocks can be any shape but are traditionally rectangles. The metals most commonly used in Native American jewelry are sterling silver or coin silver. You can read about coin silver in a previous post. It should be noted that some vintage ingots are “blends”, that is mostly Mexican coins with a few US coins thrown in OR vice versa. Also beginning the 1930’s the blend could be sterling silver with a few US coins thrown in or any variation thereof. That’s why the exact silver content will vary widely in vintage jewelry. The beauty of silver is that it can be flattened, stretched, shaped and twisted using hand tools. To make an ingot, the chosen metal is melted, then poured into block forms. Once cooled to the perfect working temperature the blocks can be hammered into sheets, wires or other shapes needed for the piece. Silver, sterling silver and coin silver are all malleable, that is they are soft enough to be worked with hand tools – the silver is often reheated in a fire pit or forge several times before the piece is finished. Silver is hammered while it is still hot because it’s much softer than when it’s cold. It stretches and spreads faster when hot. It needs to be reheated after only a few hammer blows because if hammered too long it will crack. It takes a lot of experience to hammer an ingot without it cracking. If it is not hammered on all sides before reheating for the next round, it will crack……..which means back to square one, remelting and making another ingot !! Jewelry that was hand forged and hand hammered is now rare, collectible and expensive because most modern jewelry is no longer hand-hammered from ingots except by master smiths preserving the tradition. A large amount of contemporary Native American jewelry is made from machine-rolled sterling silver sheet and wire and pre-made elements like leaves, flowers and buttons. One way to tell that jewelry has been hand hammered is the impression of tool marks. The early bracelet below was made from an ingot – the surface wrinkling is a telltale sign. 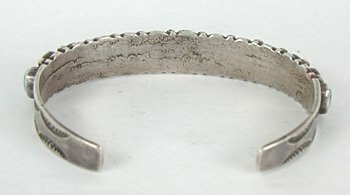 Although the wrinkling shows that this bracelet was made from an ingot, had the smith sanded or filed through the wrinkles and made the surface smooth, it would no longer show any signs of being made from an ingot, but it still would be ingot jewelry. Thanks to Mike Schmaltz for his help with this information.